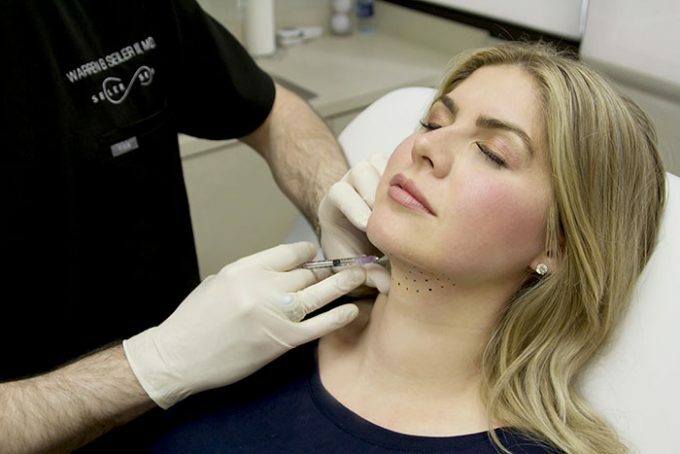 Kybella (deoxycholic acid) is the first and only prescription drug that is FDA-approved to treat submental fullness under the chin and on top of the neck muscles (“double chin”). Kybella is manufactured by Allergan (maker of Botox Cosmetic and the Juvederm family of fillers), and produces surgical results (akin to liposuction) without the risk of scarring. Kybella is injected with minimal discomfort under the skin to lyse and permanently remove fat cells in these areas. 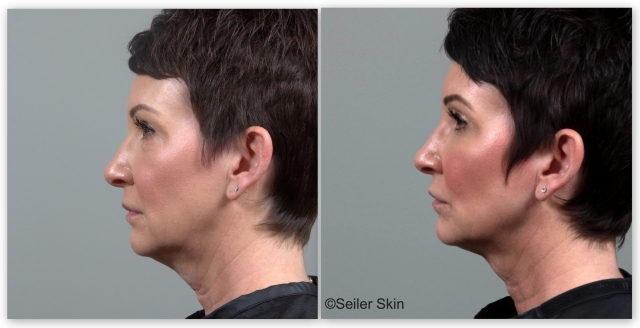 Why come to Seiler Skin for Kybella? Kybella is an extremely effective and powerful treatment, and must be administered by a highly skilled injector. In Alabama, Kybella can only be injected by a medical physician. Because Kybella is such a powerful treatment, it is very important that the administering physician is both experienced and trained in advanced injection techniques to ensure a minimal risk of complications and produce optimal results. Dr. Seiler was one of the first physicians in Alabama to offer this treatment to his patients. He trains other physicians and practitioners for Allergan on how to properly use Kybella in their practices. Thanks to Dr. Seiler’s surgical and specialty training, he can correctly identify whether Kybella is the right treatment for you, and will recommend if other non-invasive treatments (like CoolSculpting) and/or surgical interventions are more appropriate to produce desired results. At Seiler Skin, our mission is to provide an honest evaluation of your concerns and treatment recommendation to help you achieve your skin health goals. Kybella treats submental fullness (“double chin”), which is caused by a localization of fatty tissue generally non-responsive to diet and exercise. Kybella is currently being studied for treatment of fat cells on other body areas. Previously, surgery and liposuction were the standard treatment for a double chin, but were not always effective and can produce unwanted side effects, such as scarring. Submental fullness can impact men and women of varying ages, and can be influenced by several factors, including aging, genetics and weight gain – all of whom are great candidates. According to a recent survey from the American Society for Dermatologic Surgery, 67 percent of people reported that they were bothered by their double chin. As a point of reference, 69 percent of people reported that they were bothered by lines and wrinkles around their eyes (“crow’s feet”), proving the need for a non-invasive treatment like Kybella. Yes, Kybella is safe only when performed by a highly skilled injector. Dr. Seiler, along with other well-respected cosmetic physicians, believes that Kybella – moreso than any other non-invasive treatment – can cause complications in the wrong hands. What is the downtime after Kybella? After treatment, you may experience minimal, temporary bruising. You will experience swelling for three to seven days after treatment; however, our patients report that this generally does not interfere with their normal activities. During your consultation, we will discuss this with you in detail so you know exactly what to expect. What are the results of Kybella? Kybella effectively and permanently removes fat cells in the treated area without any scarring, and results typically peak three to six months after treatment(s). Kybella can also produce significant skin tightening. Dr. Seiler’s patients have actually seen results that equal, and even surpass, those of liposuction or surgery. Although each treatment produces results, Kybella is generally recommended in a series of two to four treatments. The number of treatments required depends on the severity of your concern. We may recommend CoolSculpting alone or in conjunction with Kybella to reduce the number of treatments and overall cost necessary to achieve your desired results. Conquer Your "Chinsecurity" with Kybella®!